We had 24 Perfect Camping Nights in August! And now August makes way for September, cooler nights, and back to school. What a month it was, though! Of the 31 days, barely a week of them in total failed to qualify for camping perfection. We won't talk about July, which resembled late spring far more than mid-summer. We didn't get out as much as we wanted to in August, but did enjoy every gorgeous summer evening, camping or not. We three boys managed to sneak our camper into a wooded site at Holiday Hill, near Springwater NY, on a very busy August weekend. All of our "usual" spots were taken, so we found a new -- and very nice -- place to camp. There were less than ten available sites when we arrived, and we liked this one the best. We never got to Holiday Hill last year, when gasoline peaked at over $4 per gallon. Instead, we stayed much closer to home at the Canandaigua KOA. The Hill is one of our favorites, just because. Maybe it's the secluded but popular location; maybe it's the people (though HH has new owners this year); maybe it's the great swimming pool. Some places just 'feel right,' and this is one of them. Our new site was in the brighter section of the woods, near the Froggy Pond, and still close to all the amenities. The boys spent some time in the game room, and later at the pavilion for a musical event. It was a bit cloudy and cool for swimming, so we didn't get wet. Plenty of other campers jumped in during the afternoon. We played mini-golf instead. Night arrived suddenly, back there in the trees. We spent some time reading, until we couldn't see anymore, then just hanging out together by a roaring fire. We forgot to bring marshmallows. The mosquitoes left us alone, though; so that was a relief. Of course that weekend trip was over too quickly, as any good camping outing always is. No sense complaining. We've had a decent summer of short camping vacations. Got lucky back in July with a rain-free weekend at the nearby KOA for our first trip. Our journey to Sackets Harbor was sopping wet, but the weather turned sunny on arrival. Late July found us in Mexico NY at the Jellystone campground with a whole batch of good friends -- another lucky, sunny weekend. The fireworks, for Oswego's Harbor Festival, were incredible as always. We have one more trip in the books, for the Labor Day weekend. We've always loved the Dansville Balloon Festival, and camping is the way to spend some quality time there. The current forecast is excellent, although the nights are already seeing temp's dropping down below 50 degrees. Last year's festival was ruined by horrid weather; we didn't even make it a day-trip and most of the vendors gave up and went home. Fingers crossed for this year. Soon enough, it'll be time to switch to day hikes and photo-tours of the fall foliage. Just don't rush me, okay? How about you? 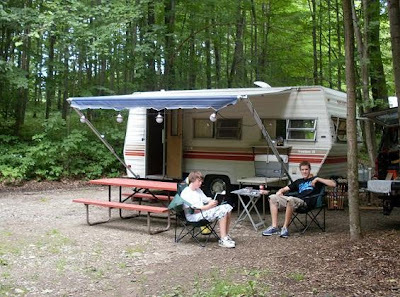 Do you have a campground story you'd like to share? If you'd like to submit your review for posting, you can reach me via Comments or by using the link at the top of this page. You can hardly wait. The children are excited . Your hard-working urban family is about to embark on an adventure of camping, the annual idyllic migration to freedom, nature and the magic of fresh air. You envision fun in the sun, relaxation, and the enjoyment of breath-taking scenery with beautiful sunsets and smooth sailing. 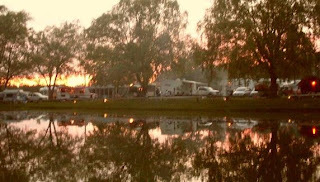 You intend to enjoy fishing, swimming, boating, and best of all, peace and quiet. On a camping trip, enjoyment and relaxation is the whole idea, but how do you keep it that way? How do you avoid clashes with your spouse and children while camping? It may not be immediately evident that a primary cause of clashes during camping is failure to correlate and adjust expectations when planning a camping trip. A reasonable compromise on the type of camping trip you are taking, may be wisdom at it's finest. Reprinted by permission from Raymond Alexander Kukkee, all rights reserved 2009. How about you? 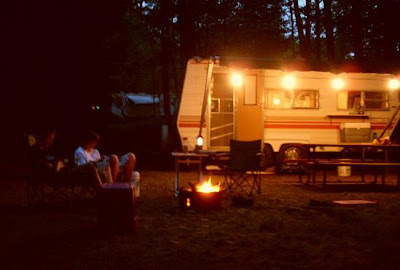 Do you have a campground story you'd like to share? We always enjoy featuring guest authors. If you'd like to submit your article for posting, you can reach me via Comments or by using the link at the top of this page. From the file marked "things that make you say hmmm..."
Over the preceding months I've tried to offer you some helpful camping tips, along with other related articles, pictures and stories. In addition, down the page a ways in the sidebar, I've linked to a number of blogs of similar theme. I've found these blogs and lots of great article ideas by subscribing to a Google Alert for "camping tips." Every day I get a nifty email from Google listing all sorts of interesting postings from around the world that are somehow related to camping tips. Sometimes the relation is tenuous at best, with the words "camping" and "tips" separated by other words that veer off into unrelated topics. These alerts are always informative and often entertaining. Some days one or two of the offered snippets leaves me scratching my head. Today was one of those days. Rather than scratch my head some more and risk further hair loss, I've decided (just this one time) to share the puzzling text with you. Perhaps you, better than me, can fathom its meaning. Go camping predominantly. The pre-eminent mode to grasp the bodily is to spread out not numerous days camping together. And what can be more affectionate then sitting together approach tense close axe and watching the flames? I sincerely detect a wonderful tip for romantic camping here. It's in there somewhere. Granted, it's only a snippet of the original posting, so other contextual clues might be missing. I do love grasping bodily and watching the flames. However, the whole "tense close axe" concept has me concerned. Okay, maybe I'm being mean. I realize that the Internet is indeed a "world wide" web. For some, our befuddling language presents translation challenges. Still, this camping tip hints at well-intended and thoughtful insight. If I could understand the author's intent, I'd be happy to link to the original post. Posted by Jim, who really isn't a mean person. Can you help me translate the quoted camping tip? Your Comments always welcome. Croquet: Here's a game we all can play together! Some campers like to find remote mountain streams filled with trout. 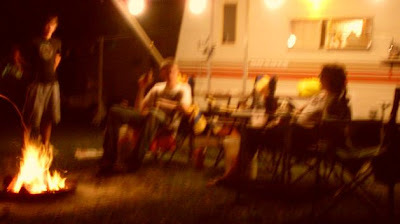 Since we have teenagers to entertain, we prefer busy camping resorts filled with people. We love to play games to pass the time and avoid the dreaded cries of "I'm bored." One of the best group games we always enjoy at the campground is croquet. Most of us have played croquet at one time or another. Croquet is at least as old as the game of golf, and far less expensive to play [game sets retail from $30 to over $300]. As long as you can find a reasonably well-groomed grassy area, you can gather up a crew for a round of croquet. You don't need lessons or a handicap to compete, and there are no greens fees. Up to six players can compete individually, or you can form up teams for larger groups. The object of the game is to navigate a course of small wire wickets by striking a wooden ball with a mallet. There are interesting rules variations for recreational play, as long as everyone agrees beforehand. Playing croquet is a fine game for getting a bit of exercise, sun, and socializing along the way. 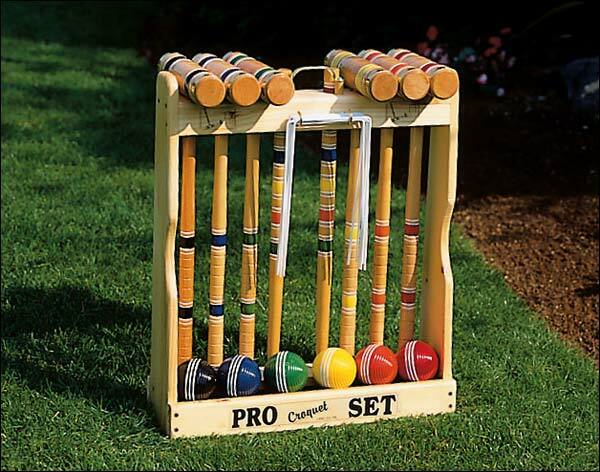 What makes croquet such a good choice for camping? 1. Players of all ages can compete. Kids always enjoy hitting things with mallets. Grown-ups have plenty of time to chat it up between turns. Even someone confined to a wheelchair can join the fun. 2. A little rain or wind won't ruin the game. While the balls and mallets are wooden, they are quite durable. You can play through a cloudburst without worrying about damage. 3. Croquet is cheap and portable. You can find used games at garage sales and charity stores for less than $20. Some come in folding cases, while others take up a bit more space. A standard set will fit in the space of a suitcase. 3. No batteries or power cord needed. All the energy required to play is supplied by the contestants. 4. Games can be as long or short as desired. All you have to do is vary the size and/or complexity of the course layout. Purists will insist on the design set out in the official rule book; but lots of players enjoy plotting out more creative wicket locations. 5. There's room for at least six players. Your kids can invite their new campground friends. You can play as couples, making room for twelve. For even larger crowds, you can form teams and take turns with the mallets. 6. You can leave and come back. When the burgers and steaks are ready, everyone can break for dinner right in the middle of a game. Eat, drink, and then pick up right where you left off earlier. 7. Nobody has to keep score. Croquet is a game of geography: first to the end-stake wins. No points to count keeps things the stress and arguments to a minimum. How about you? Do you have a camping games review you'd like to share? We'll feature these during the season as available. If you'd like to submit your review for posting, you can reach me via Comments or by using the link at the top of this page.